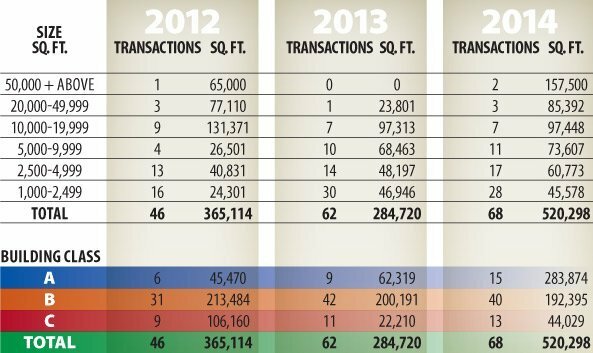 The overall office vacancy rate in Omaha is down. Office space absorption is positive and average asking rental rates are rising. Omaha-based firms continue to set the pace for office space demand. Union Pacific, Kiewit, Medical Solutions, West Corporation, First National Bank and WebEquity Solutions all took additional space recently. Add in businesses with a growing Omaha presence, like LinkedIN and Regus, and the market can be described as energized. 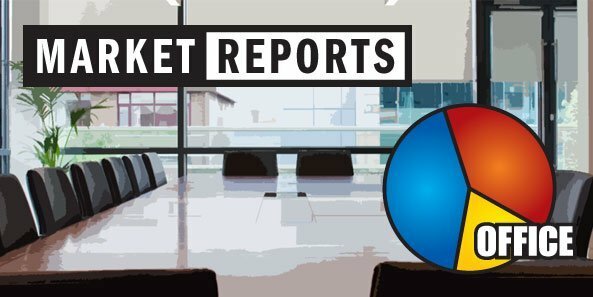 Although the number of office lease transactions of 1,000 square feet and larger only increased from 62, in the first half of 2013, to 68, in the first half of 2014, the amount of square feet leased nearly doubled from 284,720 to 520,298. The two largest transactions in the first half of 2014 were by Tenaska and Gordman’s. Together they accounted for 158,000 square feet. However, the amount of office space leased is up notably even without these two transactions. There were more transactions in every size category and there are several larger users in the market now. While we still see businesses trading spaces, we more often see businesses growing their footprints, and back-filling spaces when they become vacant. Two of Tenaska’s three Miracle Hills buildings filled immediately upon Tenaska’s move to FNB Business Park. In addition, Union Pacific has taken two floors at Central Park Plaza and may need more space. WebEquity Solutions moved into 23,000 square feet in Westroads Office Park IV in 2013 and expanded into another 10,000 square feet this past quarter. Unfortunately, there aren’t any new companies moving into Omaha. Omaha’s office vacancy rate is the best we’ve seen since the economic downturn, indicating the market has finally found traction. 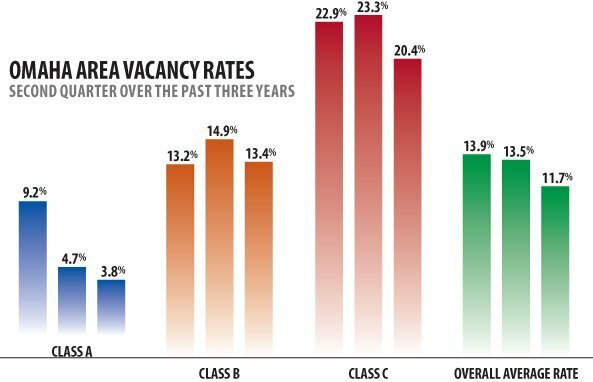 Vacancy rates have fallen across the board as a result of market activity and limited new construction. The overall vacancy rate is down nearly 200 basis points from last year, declining from 13.5 percent to 11.7 percent. Class A has been our primary source of good news for the last several years and vacancy of this class has fallen to 3.8 percent, which is too low for a vibrant market. The new story is the 150 basis point drop in Class B, to 13.4 percent and the 290 basis point reduction in the Class C vacancy rate, to 20.4 percent. Average asking rental rates, expressed as full service rates, increased in all classes in year-over-year numbers with Class A rates up $.50, or 2 percent. Class B was up $.19, which is a 1 percent bump, and Class C is up $.10, a .7 percent boost. The overall increase in these rates is a reflection of good market activity and landlord confidence. Absorption, the net change in occupancy from period to period expressed in square feet, was positive for the first half of this year by 278,937 square feet, which is up from negative 53,000 square feet year-over-year. Absorption was positive in all classes with A having 93 percent of the total and B and C each seeing about 10,000 square feet. Little new construction started in the first half of 2014. The Pacific Life Building in Aksarben Zone 5 is underway, and plans are in the works for a significant office building next to Pacific Life to house the Foundation(s) of the Walter Scott Family and related entities.